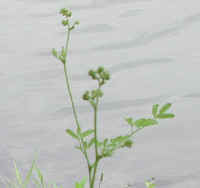 (Meadow Rue, Tall (Thalictrum polygamum) - 01) These meadow rue are growing on the edge of the lake with iris, daisy and other plants. 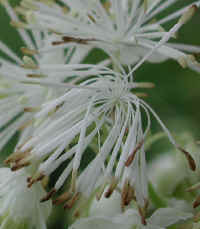 The meadow rue are the tall thin plants with the pinnate leaves and bud clusters. 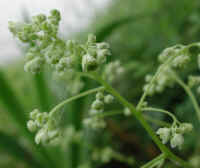 According to the literature, tall meadow rue can grow to heights of 3 to 8 feet, and these are barely 3 feet tall, which gave us a little problem with our identification. Since all other aspects of our identification fit, and those of other species of meadow rue didn't, we decided to accept these wildflowers as tall meadow rue. (Meadow Rue, Tall (Thalictrum polygamum) - 01a) Prior to blooming, the tall meadow rue can be identified by its tall, thin, "branching" stem with pinnate leaves of 3 or more leaflets, seen here growing in front of the iris. (Meadow Rue, Tall (Thalictrum polygamum) - 01b) The flower buds develop on the top of the tall meadow rue. 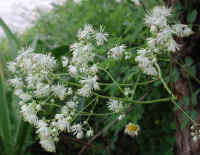 The leaves of the meadow rue were smoked as a tobacco; and the smoke, if blown in the ear, was considered to be a cure for deafness . 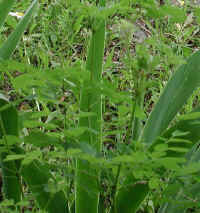 Hippocrates wrote that rue was a "soothing herb. (Meadow Rue, Tall (Thalictrum polygamum) - 02) In this photo of the tall meadow rue, we can see the buds just beginning to open. 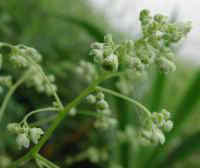 Technically, the flowers of this meadow rue form a panicle, a compound raceme that is elongated with diversely branching flower clusters. (Meadow Rue, Tall (Thalictrum polygamum) - 02a) The flowers of the tall meadow rue have 5 sepals and no petals. 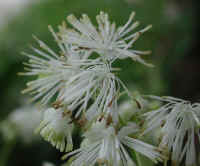 (Meadow Rue, Tall (Thalictrum polygamum) - 03) Many of these meadow rue flowers have opened with their frilly array of staminate flowers. (Meadow Rue, Tall (Thalictrum polygamum) - 04) The generic name of the tall meadow rue, polygamum, comes from the word "polygamous" which means that the plant has both staminate and pistillate flowers. (Meadow Rue, Tall (Thalictrum polygamum) - 04a) Looking closely at these 3/4 inch flowers of the tall meadow rue, it is interesting to realize that the tall meadow rue is a member of the buttercup family.